The Idukki district, India’s largest producer of cardamom, is faced with the destruction of crops from a devastating flood, low yield and the loss of a major importer. In Kerala’s Idukki district, cardamom is a way of life. As the largest producer and exporter of cardamom in India, the district has created an assiduous industry around the spice. Harvesting cardamom is a meticulous process that is typically done by hand. The spice must then move through dozens of steps before it finally ends up in shops and kitchens. The demand for cardamom from Idukki has grown in recent years. The spice’s subtle, unrivalled taste has found favour in cuisines outside its traditional use, while it’s still used widely in the Middle East and India. But nothing could have prepared the district for the devastation that wreaked during the August floods and landslides in 2018. Acres of cardamom fields were destroyed and out of 40,000 cardamom farmer families in Idukki, almost 60% lost their crops in the floods and landslides, taking away their sole source of income. What’s more, the industry has seen another hurdle as one of India’s biggest importers of the spice recently banned cardamom because of a presence of pesticide. Idukki’s thriving cardamom production has fallen on hard times, and now the cultivators, traders and workers behind the spice are left wondering if, and how, they will recover. Nedumkandam, a taluk in Idukki known for its cardamom and pepper production, was significantly affected by the landslides. Even seven months after the devastation, the effects of the landslides are still deeply impacting the farming community in the area. Boulders, fallen trees and debris have distorted this small and sleepy village in the district. On August 8, Benny Kunnel, from Nedumkandam in Idukki, lost a major portion of his house in the landslide as well as one-acre of his cardamom field. “It has been six months since I planted cardamoms. It usually does not take two months for the crops to grow more than one meter, but since the topsoil was washed away and covered with sand and debris, it has lost its fertility and is not cultivable,” he said, pointing to the barren field land and wilted crops amidst the rubble. “The yield has reduced by 100 kilogrammes. The growth of the crops, too, has been stunted,” he added. For more than 24 hours, stagnant flood water submerged the crops, decaying its roots and capsules. Idukki, the second largest district in the state, was one of the worst affected areas during the floods. People watched as their houses, crops and properties were washed away, and farmlands were rendered infertile. But people here can’t just worry about battling for promises compensation from the government to rebuild their lives. Farmers who have cultivated cardamom for decades are facing a significant crisis as the spice sees a fall in production. MJ Joseph has been a cardamom farmer in Anakkara in Idukki for the last 20 years. Though he used to yield 4,000 kilograms of cardamom per year on 2.5 acres of land, after the floods, he lost 80% of his crops. “Before the floods, I would earn Rs 1 lakh from one-acre yield. I managed my other expenses using this income. But I also have to spend on labour wage, pesticides that have to be sprayed monthly, tilling the soil, because the yield depends on the amount of care we give in cultivating - that's the feature of this crop,” he said. Currently, Joseph is hoping to revive what is remaining of his crops. “I am watering to see how much can be revived. I hope to revive at least 20% of what remains. This can be estimated only after two months, and then accordingly, I will remove the old crops and plant new ones in the next season. That is what I am aiming for,” he said. 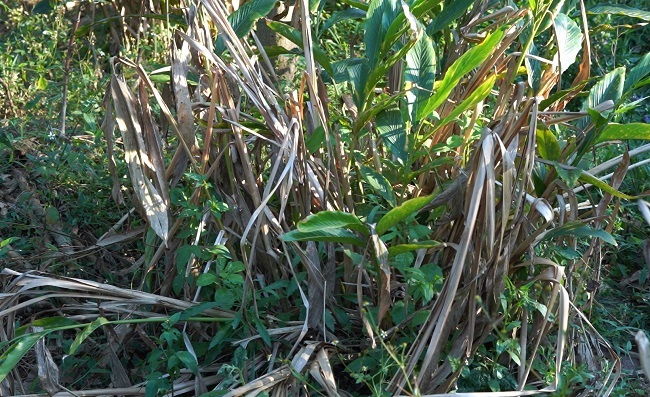 Cardamom cultivation, according to Idukki farmers, is akin to caring for a baby. It’s a laborious process, one that makes the spice, especially green cardamoms, so expensive. Idukki’s farmers are also known for their innovative experiments with the crop. TP Joseph was awarded the National Grassroots Innovation Awards for developing Thiruthali, an improved variety of cardamom. Similarly, Sebastian Joseph was awarded for developing another cardamom variety called the Njallani. Cardamoms are harvested between July and December, but the floods hit Kerala during the harvest season rendered the labourers engaged in cardamom cultivation unemployed for over a month. 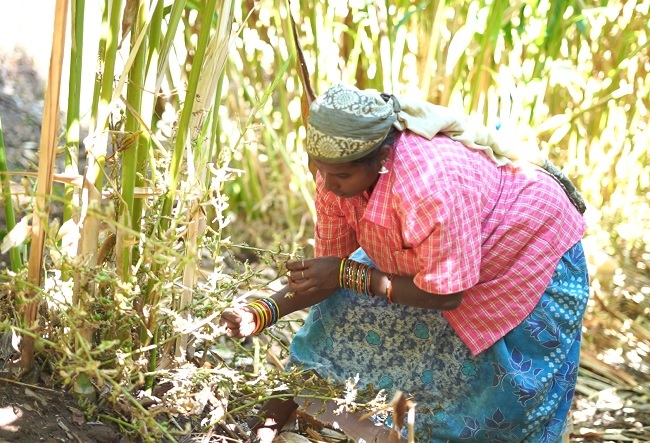 “Every monsoon, we never sit at home, but during the last rains, we were at home for more than one month, with no work,” said Annamaria, who has been supervising the harvest work at a cardamom field for the last 20 years. But it isn’t just the cultivation that requires painstaking detail to attention. Typically once the cardamom is harvested, the ripe fruits are washed and dried in a furnace. The dried fruit, which is the cardamom for commerce, is then sent by the growers to small depots. These are then taken to various e-auction centres set up by the government-run Spices Board. 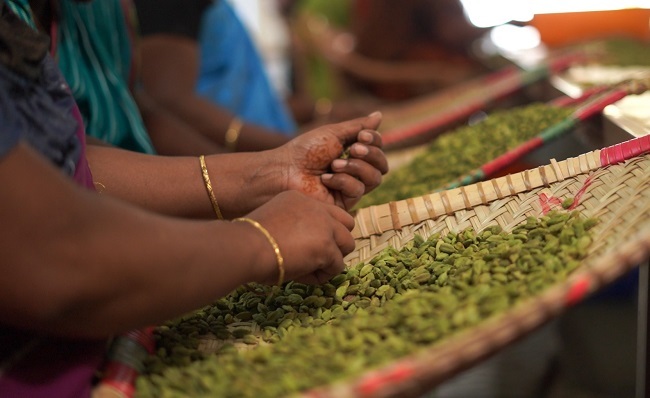 Licensed traders from across India inspect these cardamoms and place their bids. 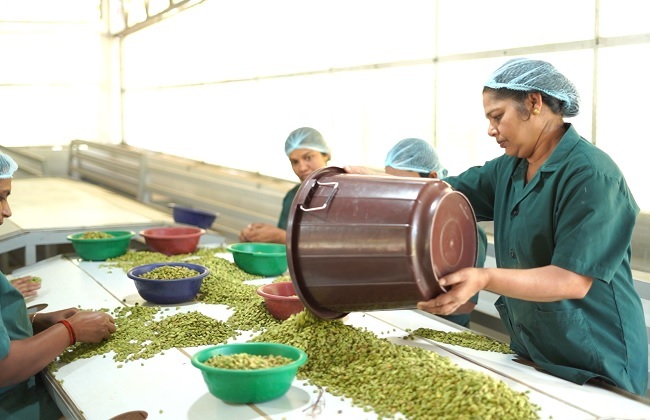 Once the bids are placed, cardamom capsules are sorted according to their size. 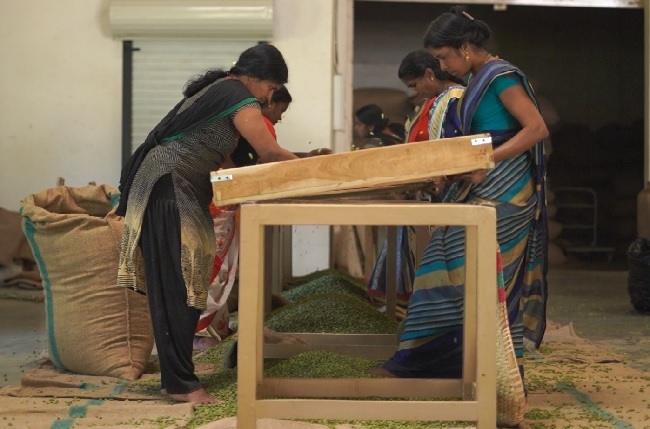 Skilled women labourers then manually sort these capsules using sieves of different mesh size, which determines the grade. The cardamom capsule of 8 mm diameter size with black seeds commands a high demand and is considered first grade. Green cardamoms are also popular and find a great market in the Middle East. The lowest grade of cardamom capsules are sent to factories producing masala powder and paan masala. The typical cost for one kilogramme of cardamom was between Rs 600 and Rs 1,000. But that was before the floods. In the post-floods market, farmers have only 40% to 60% of their original crops and the yield has dropped to 20%. Though prices have now been hiked to between Rs 1,500 and Rs 1,700 per kilo and traders argue that this will help compensate the farmers, the growers say otherwise. Those who have lost most or all their crops say that the price rise is a useless form of compensation if there is no yield. Traders in the industry, however, want to keep the prices at a minimum, although the farmers are not happy with this, considering their damages. In May 2018, Saudi Arabia, which accounts for 90% of cardamom export in India, banned products that contain traces of pesticide, including cardamom. 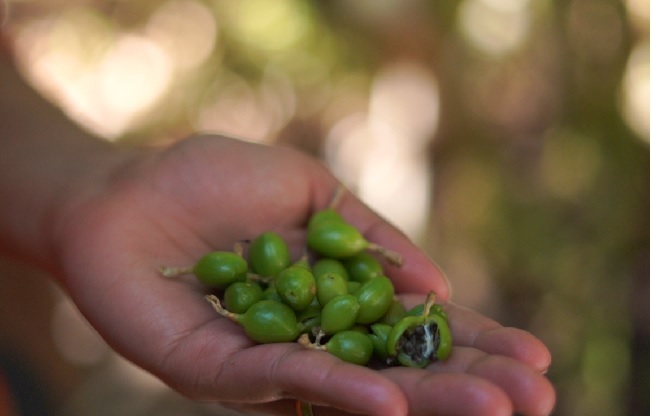 It was another major challenge that struck the cardamom industry before the floods arrived. “There is a certain percentage of pesticide that can be used while growing cardamom. Since more than the prescribed amount is being used in Indian cardamom, they have stopped the import,” said Subramanian. But farmers argue that cardamom plants are highly prone to diseases and pest attacks, making it necessary to use pesticides at least once a month. “If not, the income will reduce and we will not get good cardamom. If the cardamom is not good, the market price will go down. If it is good, we will get extra Rs 10 per kg. If there are scabs, we will get Rs 10 less and the demand will go down,” said Joseph. 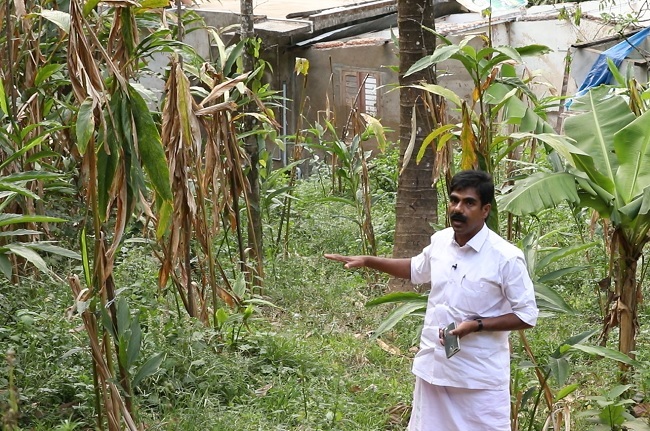 Prince Mathew, an agricultural officer in Idukki, on the other hand, told TNM that the agricultural department, which comes under the Spices Board, regularly and compulsorily convene meetings to create awareness of safe agricultural practices among the farmers, such as correct dosage and timely application. “Problems arise when that is not followed,” he said. As farmers continue to struggle to get back on their feet, they are hoping for greater government assistance. So far, that assistance has been limited.